The Caterpillar Project is a beautiful series of high-resolution cosmological simulations. The goal of this project is to examine the evolution of dark-matter halos like the Milky Way’s, to learn about how galaxies like ours formed. This immense computational project is still in progress, but the Caterpillar team is already providing a look at some of its first results. 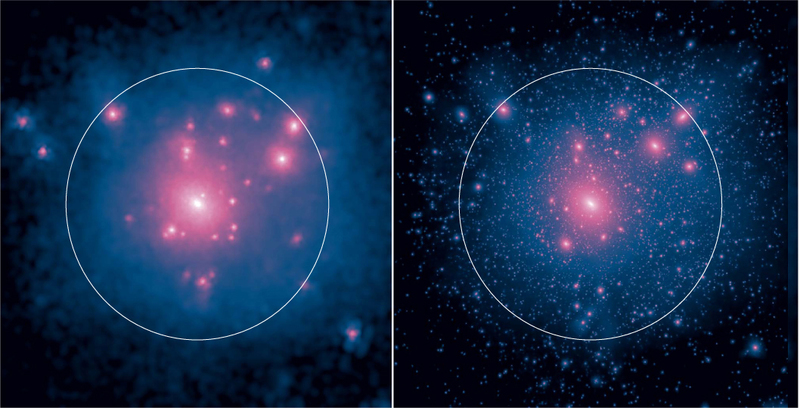 Why simulate the dark-matter halos of galaxies? Observationally, the formation history of our galaxy is encoded in “galactic fossil record” clues, like the tidal debris from disrupted satellite galaxies in the outer reaches of our galaxy, or chemical abundance patterns throughout our galactic disk and stellar halo. But to interpret this information in a way that lets us learn about our galaxy’s history, we need to first test galaxy formation and evolution scenarios via cosmological simulations. Then we can compare the end result of these simulations to what we observe today. Due to how computationally expensive such simulations are, previous N-body simulations of the growth of Milky-Way-like halos have consisted of only one or a few halos each. But in order to establish a statistical understanding of how galaxy halos form — and find out whether the Milky Way’s halo is typical or unusual! — it is necessary to simulate a larger number of halos. In addition, in order to accurately follow the formation and evolution of substructure within the dark-matter halos, these simulations must be able to resolve the smallest dwarf galaxies, which are around a million solar masses. This requires an extremely high mass resolution, which adds to the computational expense of the simulation. These are the challenges faced by the Caterpillar Project, detailed in a recently published paper led by Brendan Griffen (Massachusetts Institute of Technology). The Caterpillar Project was designed to simulate 70 Milky-Way-size halos (quadrupling the total number of halos that have been simulated in the past!) at a high mass resolution (10,000 solar masses per particle) and time resolution (5 Myr per snapshot). The project is extremely computationally intense, requiring 14 million CPU hours and 700 TB of data storage! 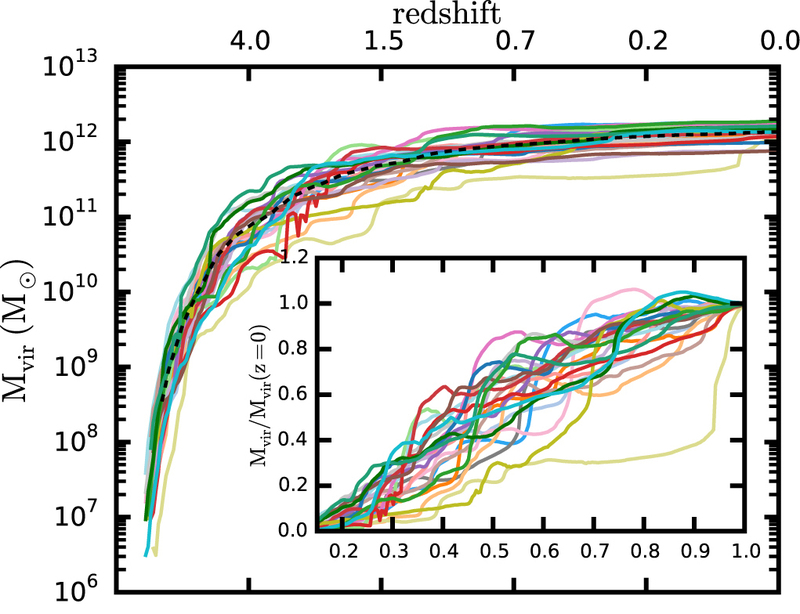 In this first study, the Griffen and collaborators show the end states for the first 24 halos of the project, evolved from a large redshift to today (z=0). They use these initial results to demonstrate the integrity of their data and the utility of their methods, which include new halo-finding techniques that recover more substructure within each halo. The first results from the Caterpillar Project are already enough to show clear general trends, such as the highly variable paths the different halos take as they merge, accrete, and evolve, as well as how different their ends states can be. Statistically examining the evolution of these halos is an important next step in providing insight into the origin and evolution of the Milky Way, and helping us to understand how our galaxy differs from other galaxies of similar mass. Keep an eye out for future results from this project! Check out this video of how the first 24 Milky-Way-like halos from the Caterpillar simulations form. Seeing these halos evolve simultaneously is an awesome way to identify the similarities and differences between them. If you access the science paper, you can see who is on the science team and the astronomical assets used in the study.